Jason is a self-taught fly dresser and fly-fisher who was able to learn in the pristine Wisconsin wilderness a few years ago. Since then, fly dressing has become an integral part of his life and he now ties commercially for lodges when free time away from school permits. 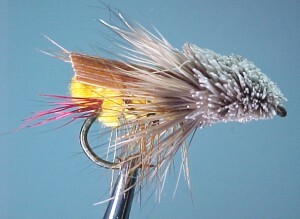 "...It is a pattern that is a cross between a Henry's For Hopper and an over-sized muddler,..."
This fly earned its way into my personal hall of fame by producing quality fish during the hot summer months of last year. In the middle of the summer heat, a friend and I set out to fish a small overgrown river located just a few minutes from his house. We had only spin-fished the water due to the tight cover created by overhanging brush. As we started our journey into the woods we commented on how one of these days we just had to fly-fishing this stream. After an uneventful morning we came to rest on a fallen long. We talked for a few minutes, had a drink of water and then decided to carry on for a while longer. Two river-bends and no fish later my friend stopped and I could clearly see that he was up to something. I wandered closer only to see him pull out a case of flies I had tied for him a while back. He probed forward and backward through the case looking for the perfect fly. With a look of satisfaction he decided on a fly what we now call "The General". It is a pattern that is a cross between a Henry’s Fork Hopper and an over sized muddler, but floats as if made from cork. I questioned my friend on how he planned to use the fly, seeing as we did not have any fly-fishing gear with us. He was not worried; he simply tied the fly to the end of his monofilament spinning line and proceeded to slingshot The General into oncoming rifles. I cast into the rifles with my trusty old spinner hoping for a magical bite but it never came. Stepping back I let my friend try his luck. To the amazement of both of us he pulled a 17-inch brown right from where my last cast had been placed. I was initially dumbfounded, but after watching the fly produce again on the next (and final) bend of the day, I was sold on its ability. Nearing the last bend, I put away my spinner and watched as the fly worked it’s magic for my friend. From a small dark pool it was able to dupe a second, and bigger, brown; this one being just over 17 ½ inches. 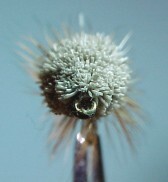 After the second brown was released, my friend commented on how high the fly floated. It reminded him of a soldier not being afraid to go into battle. And seeing as the little soldier came back from the jaws of death we deemed the fly "The General".